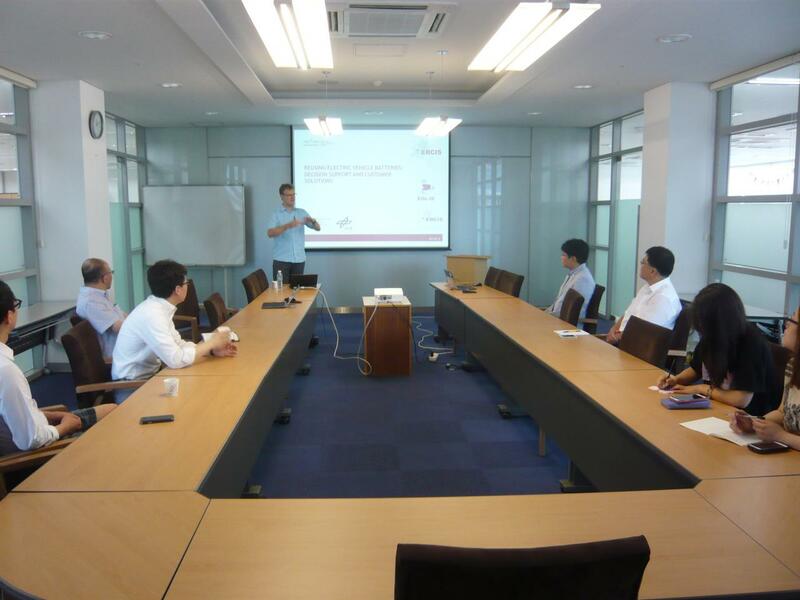 On July 30th 2014, PD Dr. Daniel Beverungen held a presentation at UNIST on "Resusing Electric Vehicle Batteries: Decision Support and Customer Solutions". This work is embedded into the EOL-IS project currently carried out at WWU. For more information consult: www.eol-is.de. Since UNIST has developed a successful battery research center and successful ties with leading battery companies in the region of Ulsan, the potential for conducting joint research and joint industry projects in this area will be assessed in the NSS project. Electric mobility is expected to greatly leverage sustainable mobility solutions. However, the diffusion of electric mobility suffers from an immature and expensive battery technology. Reusing electric vehicle batteries (EVBs) is a prospective opportunity for lowering the total costs of ownership of electric vehicles and for using natural resources more efficiently. To determine how to reuse a battery is a complex decision problem. In a publicly funded research project, we set out to develop a decision support system that implements two main functions: First, a consideration set of feasible reuse scenarios is compiled based on an assessment of an EVB’s structure and condition. Second, an offering can be configured based on bundling batteries with customized services. Amongst others, the system needs to prevent adverse effects caused by the ‘lemon market’ properties of the second-hand battery market.